During the night the rain taps and whispers on the tent fly, but I’m not keen to let it in. I’m snug in my revised sleeping “system”, which comprises a new down quilt and a new, thicker sleeping mat. The mat may rustle a little more than my previous one, but that just matches the wind in the pines. The whole percussive ensemble soon has me asleep. The next morning is very cool, and the wind is still fresh, though the rain has cleared. We pack up and leave promptly, keen to make up time after our unscheduled delay. We’re aiming first for Long Tarns. 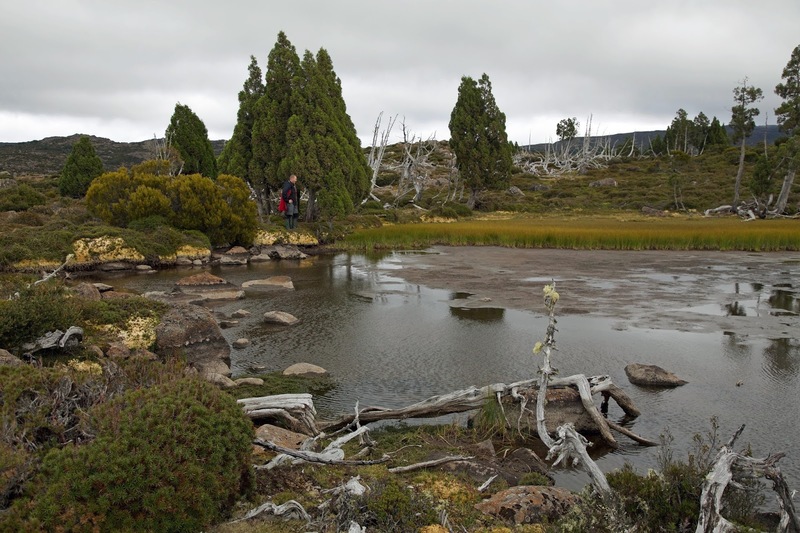 It’s an apt name for a series of interconnected linear tarns that run almost 3km from north-west to south-east. They create an effective barrier to anyone walking from our direction. I’ve been to Long Tarns before, but my memory of that trip – back in the early 1980s – is not only faded, it’s geographically irrelevant. 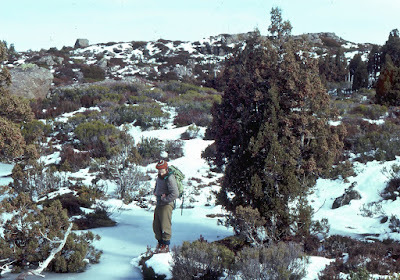 It was winter, and I’d come only to the northern edge of Long Tarns after an ascent of Mersey Bluff. An old photo has me standing at the edge of the tarn, as if pondering the possibility of skating on its thin ice. Looking back it’s dizzying to think of something like 36 years of personal familiarity with this country. It feels akin to a songline for me. 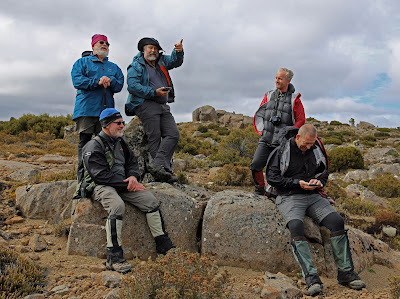 On this occasion we’ve gone around the southern edge of Long Tarns, though only after seeing whether the summer “low tide” would allow us to cross a little further north. It wouldn’t. But we do find a couple of large rock cairns, which we guess are associated with the long-disused drove route known as Ritters Track. “Track” is now a misnomer, as there’s no clear sign of it on the ground, and we find it much easier to simply go cross-country. After a short break at the southernmost of the tarns, we strike our first bit of scrubby country. And now we have to lift our legs higher, land them a little less certainly, and take longer in finding a way through or around the scrub. Walking poles briefly become a nuisance as they get caught in the bauera, cutting grass and teatree that sometimes block our route. The going soon becomes easier, but when we find an open meadow near a shallow lake, we’re more than ready for a lunch break. Rocks allow us to recline, the sun obliges by starting to shine, and we have a decent rest. But just after we get walking again, trouble strikes. There’s a muffled shout from the rear of the group, and I turn to find Mick on the ground. He’s wincing and oohing, and appears to have twisted his ankle quite badly. But after a short recline, Mick convinces us it’s okay. He gets to his feet, and starts testing whether his ankle will hold his weight. It does, but some of us have experienced Mick’s “man-of-steel” stubbornness before. We strap the ankle, slow our pace, and watch him carefully for the next few hours. By mid afternoon we’re drawing close to Mt Jerusalem, the first mountain on our side of the Walls of Jerusalem. There are also lakes and pools aplenty – as there have been the entire walk – but we’re on the lookout for one in particular. We’ve decided Lake Tyre, being just inside the “official” Walls, is our first potential camping spot. Again my memory of it from a 1980s trip is useless, as I didn’t camp there, and have no recollection of its potential as an overnight stop. Soon enough, as we approach the lake’s eastern edge, we have an answer of sorts. There’s a large open area near the shore, although it’s not well sheltered, and is somewhat lumpy. Everyone is tired, but a few of us decide to leave our packs and scout around on the other side of the lake. We can see pencil pine stands on both the western and northern shores, and think they might offer better shelter. It turns out that west is best, and we hoist packs and spend another 20 minutes scrambling around to the far shore. Our decision is met with some grumpiness from one (nameless) member of our party. He’s already found the perfect nook for his tent on the eastern side, and is not happy with being uprooted. After a certain amount of chiding – in the gentle spirit that has pervaded our walk thus far – our grumpy friend settles into his new (inferior!) site, and eventually joins us in enjoying what turns out to be a spectacularly beautiful evening. The sun stays with us, the wind eases, and under clear blue skies the lake’s surface turns a glassy deep blue. I had always thought this lake was named after the biblical city of Tyre – an ancient Mediterranean port – given that so many other place names in the Walls follow biblical themes. If I was puzzled that nearby Lake Thor bore a name from Norse mythology, I figured that might have been some kind of early ecumenical gesture. 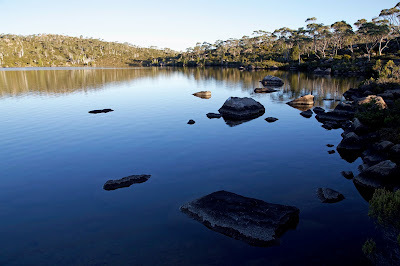 I have since heard that pioneer Walls of Jerusalem bushwalker, Reg Hall, had cheekily named these two lakes after two women he often walked with in the mid part of the 1900s. So it seems that Lake Tyre is named for Peggy McInTYRE, and Lake Thor for Joan THORold. The next day is relatively short. We’re keen to avoid the crowds that we know will be in the central Walls area, so we’re heading for Tiger Lake by dropping down beside Zion Gate and into Officers Creek. Along the way we sadly farewell Tim and Merran, who have to walk all the way out today. Our destination reminds a few of us that there’s a kind of anniversary to mark at the lake. It’s five years since we first met Libby in this very park. 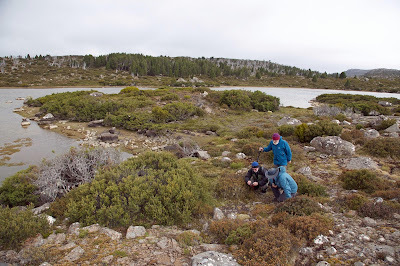 Then new to Tasmania, she was walking solo, but happily tagged along with us when she heard we were going in search of Solitary Hut on the side of Tiger Lake. She’s been walking with us ever since, an arrangement that suits us all very well. Five years ago, we had to watch our path to the lake very carefully, as it was far from distinct. Disappointingly it’s now impossible to miss, as someone has sprayed fluoro orange paint all along the route, on rocks, trees and even on the ground. In a wilderness zone this is a very ugly and thoughtless intrusion, and something that causes more grumpiness in our group than yesterday’s campsite shift. Just before Solitary Hut, and a little above Tiger Lake, we find an open area in a eucalypt woodland in which to set our tents. But for Jim any hut is irresistible, and he decides to set up inside the hut. We visit him, though only briefly, and one at a time. The hut is both spartan and tiny, and turns out to have a healthy population of mosquitoes. 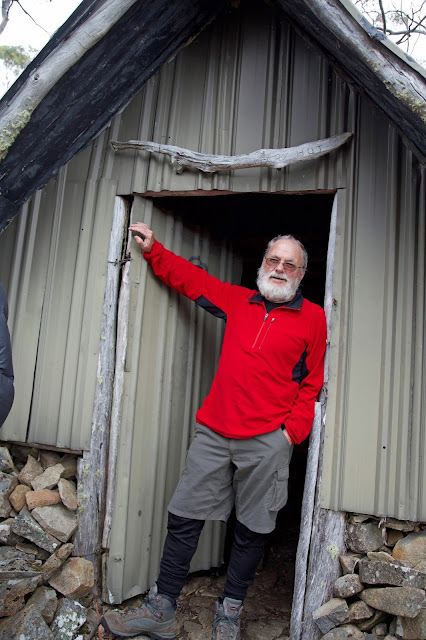 One unexpected feature of the hut is that it houses a spade. Unless you’ve spent 6 days in the bush, digging toilet holes with small trowels, you may have difficulty understanding what a magnificent luxury this is. As we depart the lake early the next morning, there seems to be a special spring in our steps. While the spade may be partly responsible, it’s also that this is to be our last day. The walk to our cars is both short and downhill, and we have the even greater luxury of a hot lunch at the Mole Creek pub to look forward to. But while a hot meal is a standout in the short term, this walk has given us much more than that to digest. 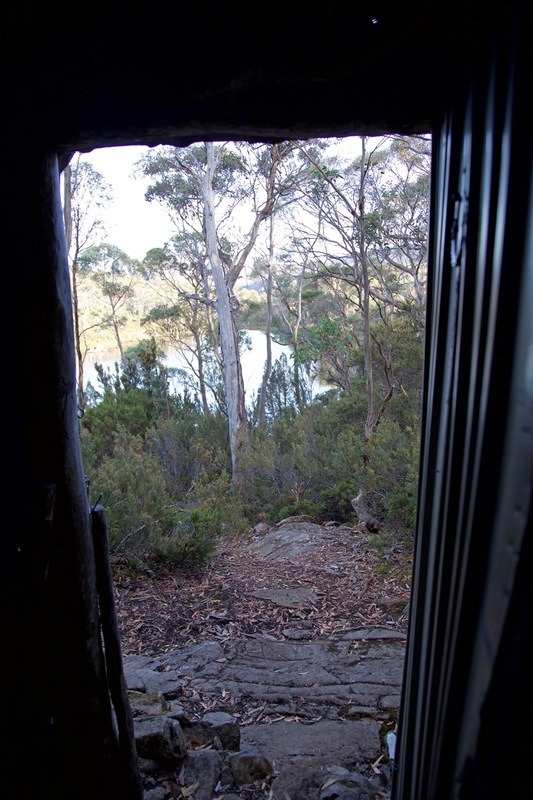 Without climbing one single mountain, we’ve seemed on top of the world – or at least of Tasmania – for much of our walk. 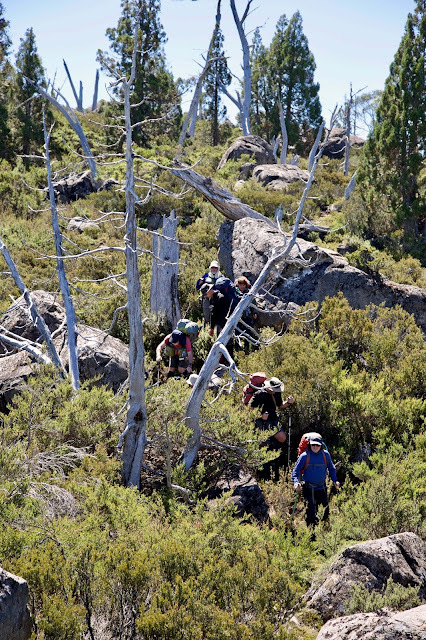 We’ve met challenges ranging from off-track navigation and large group decision making; to injury and occasionally harsh weather. For me, although it jostles alongside 36 years of other walks in this region, it will remain one of the most memorable walks I’ve ever done. 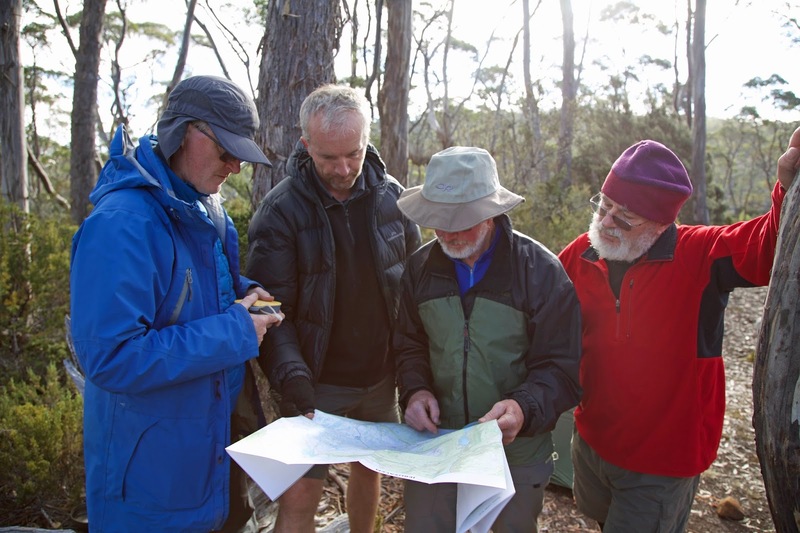 There are some activities that you would immediately associate with off-track walking in the Tasmanian wilderness. Lolling about, playing cards, daytime snoozing and planking might not be among them. When day 3 dawned on our walk across the Central Plateau, those things weren’t uppermost in our thoughts either. Rather, once we’d conferred about when to leave and how far to go, we expected to walk further into the unknown. The forecast was for wind and rain, but mostly later in the day. So getting going early, and finding a sheltered campsite before the change, seemed the obvious choice. But after breakfast, with an ominous build up of cloud and a rising wind, our group conference took an interesting turn. We outlined the options, then asked each person to express their preference. Nearly everyone was for packing up and leaving, albeit without huge enthusiasm. But at the end of the discussion one walker mentioned some hip discomfort after yesterday’s walk. When we combined that with our general ambivalence and inertia, we unanimously reversed our decision. We would stay another night in the shelter of this lovely Pencil Pine Tarn campsite. Ain’t democracy grand? Having decided we weren’t going anywhere, we promptly went for a long walk around our home lake. We figured rain and wind might soon make that impossible, or at least unpleasant. Apart from anything else, I was curious to see if there were any other campsites near this tarn. (The short answer was yes, but our’s was definitely the Paris end of town.) 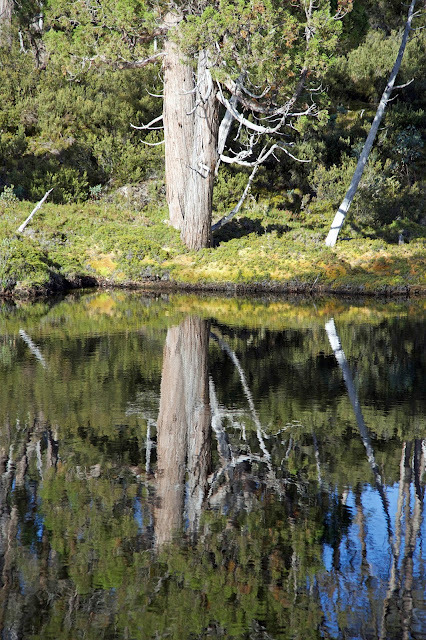 Nonetheless we found some other fine stands of pine, and a few delightful pools. We also disturbed some swans and their cygnets, and the odd wallaby. At one stage I found three of our party down on hands and knees, intently looking at something. 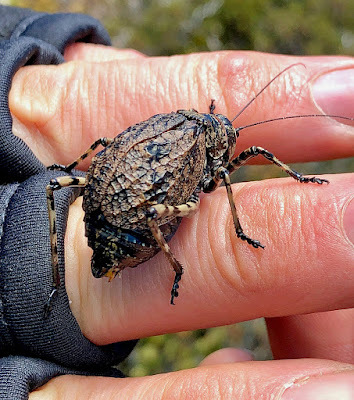 I joined them, and found a very large, oddly-coloured katydid. It was a mountain katydid (Acripeza reticulata), new to us but apparently common in eastern Australia’s high altitude grasslands. When they’re threatened they lift their wing-covers to reveal bright crimson and blue stripes, and the males emit a warning call. We mustn’t have threatened them overly, as they allowed us quite a close inspection before continuing about their long-legged business. Despite our decision to stay another night at our tarn, a few of the group couldn’t resist reconnoitring the potential onward route. 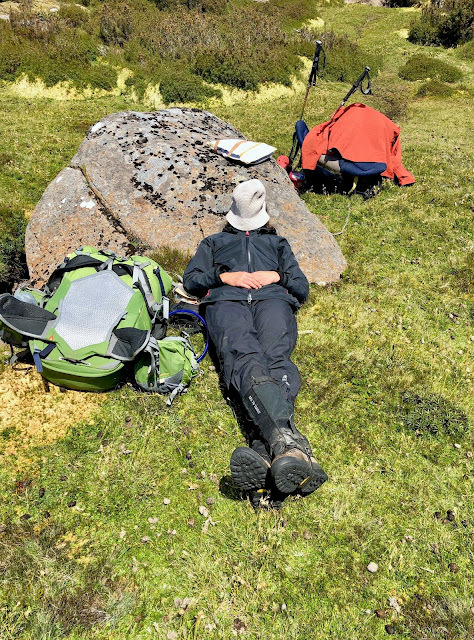 Tim D deployed his phone’s map app – a better option than a paper map in the strong wind that was now blowing – and tried to match what we could see with the terrain shown on the map. From where I stood, I was pretty sure I still heard “southish” and “westish” mentioned. With tomorrow’s navigation nailed (!) 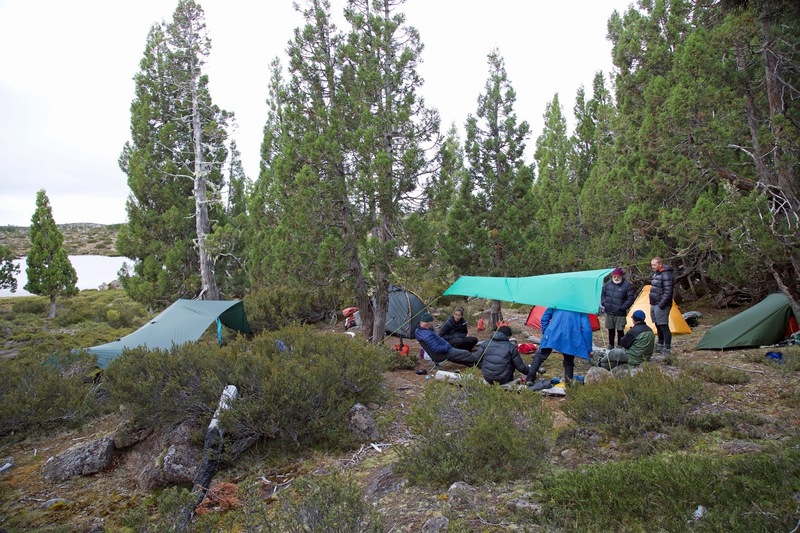 we circled back to the campsite, and settled down to a brew and banter session. At such times our talk normally centres around food (briefly) and bushwalking gear (at great length). 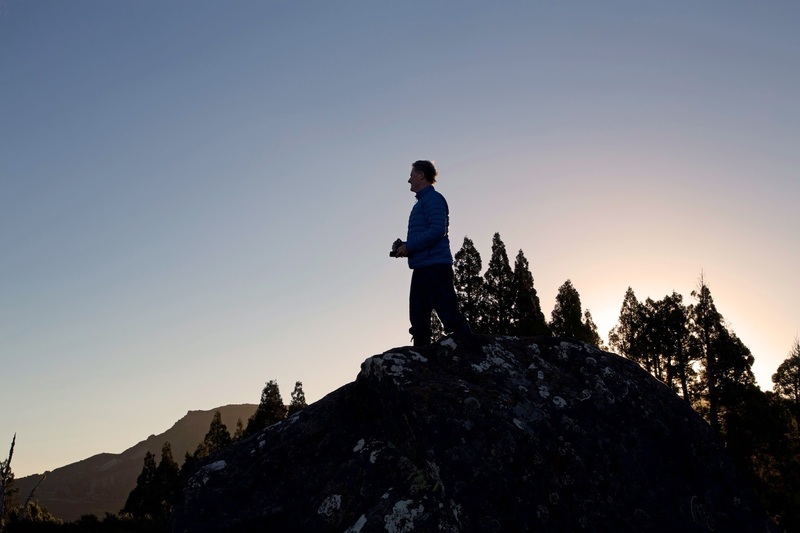 But this time our gear chat unaccountably faltered, and we somehow found ourselves talking about walking fitness, including core strength. Now up until a few years ago, I didn’t know humans had cores. I thought that was purely an apple thing. But I’d recently discovered not only that I had one, but that it could be strengthened. Even more, I’d found that as I get older and my muscle tone isn’t quite what it once was, having a strengthened core is a “good thing”. So I breezily mentioned my discovery of core-strengthening exercises, and notably planking. What ensued was an hour of (mostly) harmless fun, as we started a plank challenge. While no-one in our group would confess to being competitive, they lie! 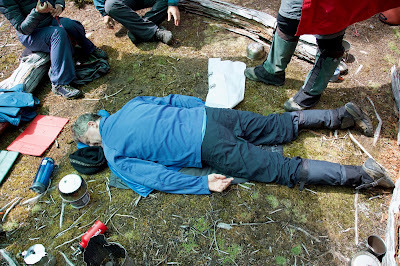 An hour later, after much pain and huffing, we declared Ken the winner of the Pencil Pine Tarn Plank Challenge. He had somehow managed to hold a plank for 4 and a half minutes. Merran and Libby were the other medalists, not that anyone was being competitive, of course. The rest of us took some consolation in our ability to lie prone for even longer. TimO seemed particularly happy to adopt and hold the prone position, even if some claimed he had simply collapsed in an exhausted heap. Either way, he set such a good example that I decided to try the same in my tent. Unfortunately it didn’t work that well, as the next (non-competitive) activity – four-handed 500 beneath the close-by tarp – soon got very raucous. Late in the afternoon the promised wind and rain gatecrashed the party, and the 500 players retreated beneath the larger tarp. The rest of us stayed tent-bound. And now we could all appreciate the wisdom of staying here an extra night. While the rain pelted down, and the wind roared around us, our tents stayed well protected. We even managed to cook in between showers, and socialise for a time over dinner. 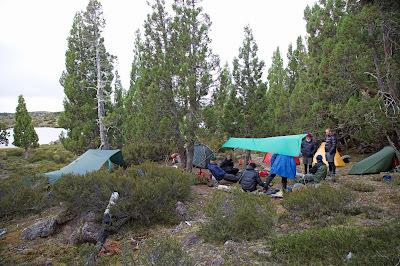 Fresh showers finally drove us – not entirely reluctantly – back to our tents. And before the light had fully drained from the sky, I’d drifted back to sleep. Downtime can be tiring, you know.